Mexico’s tourist destinations offer the full range of hotel options from five-star luxury resorts to youth hostels. Mexico hotel resorts are generally large, with a sprawling infrastructure, including swimming pools, ocean beach clubs, spas, entertainment and sports. Another group at the high end specializes in being small and elegant. They are the “boutique” hotels, which offer ample amenities, but scaled down for a smaller and more private environment. The popular hotel chains are all represented, and in the historic sections of many Mexican towns and cities, traditional hotels offer more affordable lodging. There are also many hostels available throughout Mexico. 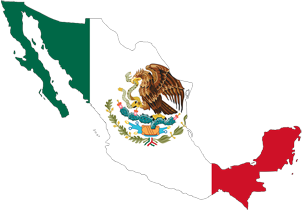 The following details may be useful when you look to book a hotel room in Mexico. European Plan: You get the room and nothing more. All meals, drinks and activities are extra. All-Inclusive Plan: This is the room, plus all drinks, meals, tips and activities. Usually more exotic tourist activities (like water-skiing and scuba diving) are not included in the hotel package. Self-Awarded. Virtually all hotels in the three-star category and upwards have conferred on themselves a star rating (usually four or five). These stars do not represent an independent judgment by anyone, and should be viewed skeptically. Website-Awarded. Almost equally expedient are some travel website star awards. Sites dedicated to booking rooms may offer their own, higher ratings for hotels they book, in order to generate more commission income. The better sites allow users to vote and comment offering more objective information. “Official” Certifications. In Mexico, the official tourism authority (SECTUR, the “Secretary of Tourism”) monitors hotels and periodically publishes data. Since 1992, the government has been out of the quality rating business. If a hotel claims to have “a government star rating,” its rating is either ancient or it is stretching the truth. For the last 18 years or more, SECTUR has simply reported volume of business (in pesos) and occupancy percentages. Independent Certifications. A non-profit entity called Calidad Mexicana Certificada, AC (nicknamed “Calmecac”) certifies hotels with a system of stars and diamonds. Stars are for physical plant and diamonds are for service. World-wide Travel Organization Ratings. Unlike Calmecac, which works together with the hotels to attain a high level of classification, the world-wide travel organizations such as AAA simply “recognize” accommodations with some number of stars or diamonds, from 1 to 5. When a hotel rate is quoted to you for a hotel room in Mexico, it should explicitly say that all taxes are included. Taxes are supposed to already be included in the price in Mexico. A second important tip is to ask is whether any charges or fees will be added to your bill besides the room rate. Most Mexico hotels charge separately for such items as telephone calls, room service and an Internet connection. Which brings us to a third important tip - avoid making calls on the hotel phone. Even local calls may be charged and international calls often cost a small fortune. It may be more economical to buy a cheap cell phone if you plan to be in Mexico for two weeks or more. Cell phones can be purchased for as little as $25 USD with several hundred pesos pre-credited. Room safes. We can’t stress this enough. When you leave the room, put everything in the room safe. However, if you have cash or credit cards, carry them with you. Don’t leave them in your room. It’s generally a good idea to carry your passport or other documents with you, but a good idea to leave photocopies of them in your hotel room in the event you lose them. Motels in Mexico are a very different concept than motels in the U.S. or Canada. In Mexico, hotels are were people stay with their families, motels are places that rent by the hour and often have mirrors on the ceiling if you catch our drift. Don’t be forgetful and leave your paper tourist visa in your hotel room. Leaving Mexico without it will likely cause you a headache at the airport and you might even have to pay a fine.